Pedestrian deaths have hit a 30-year high, surging 35 percent in the US since the record-low in 2008, a new report reveals. Officials blame distracted drivers and walkers for the sharp increase, urging everyone to pay less attention to their phones and more attention to the road. And as cars become more hi-tech and complex, screens, headlights that are supposed to be automatic, but can be confusing to operate and other features may be making the vehicles themselves distracting. The cars these features are contained in are larger, too, as more Americans buy SUVs and trucks that are more deadly to pedestrians, even at moderate speeds. An estimated 6,227 people died walking across or on US streets in 2018 – the most such deaths since 1990. Nearly half of the last decade’s fatal accidents happened in California, Georgia, Texas, Arizona and Florida, where cities built for car traffic are in the midst of urban population booms. But even without these changing demographics, cell phones would still be driving deaths up, according to the Governors Highway Safety Association report. Cars are bigger than ever and people are more distracted than ever, public safety officials say. As of 2018, all but five percent of Americans own cell phones, according to the Pew Research Center. ‘It’s an undeniable trend that smart phone use has exploded at the same time as pedestrian deaths have increased,’ says report author Richard Retting. The same is true of both drivers and pedestrians, he says. And cars are increasingly decked out with their own screens and wifi or data connections, so ‘the vehicle itself is becoming more distracting for drivers,’ says Retting. Hi-tech cars are getting bigger, too. Industry experts at LMC automotive predict that, by 2022, 84 percent of vehicles sold in the US will be a truck or SUV of some sort. Already, the larger cars make up 65 percent of what was sold in 2017. 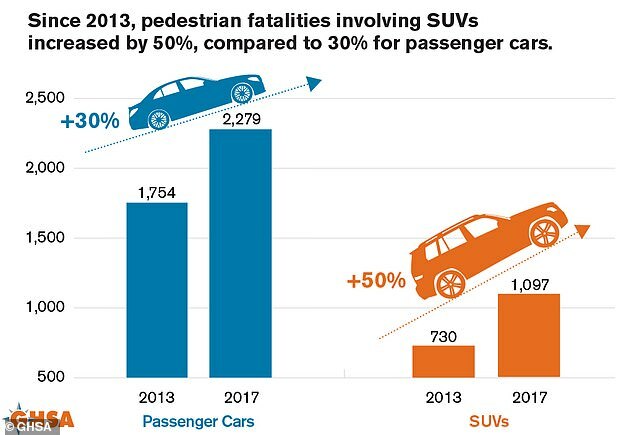 ‘The number of deaths goes up because SUVs do far more harm and the chance of fatality goes up simply because of the shape of the car,’ says Retting. ‘If an SUV or a pickup truck hits you at the same same speed (as a sedan), the death rate is much higher. This has to do with physics and the fact that the impact is now to your upper body,’ where your vital organs are located, Retting adds. 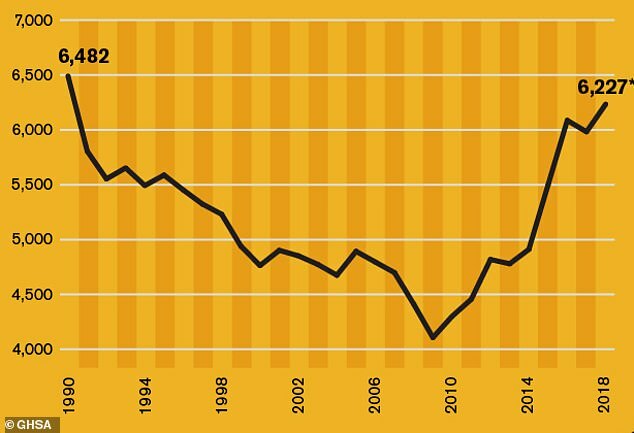 Since 2008, pedestrian deaths have increased by 35 percent, following a steady 30 year decline. 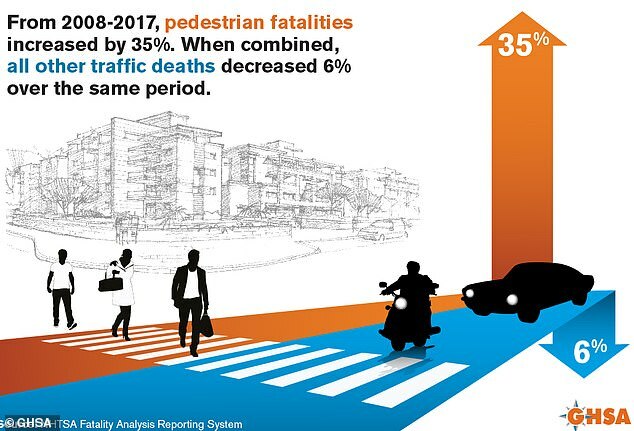 More people are walking around suburban areas that were built during a shift away from pedestrian life (helping to drive down pedestrian deaths). The legalization of marijuana may also be playing a role, Retting says. Drugs and alcohol are are constantly driving up all road-related deaths, and states that have made marijuana legal have seen overall increases in car accidents, injuries and fatalities. Retting suspects that social trends and even the connectivity of social media may be encouraging people to go out and engage in these behaviors more, too. Most of those outings happen at night, the most dangerous time for pedestrians by far. Over 90 percent of the increase in pedestrian fatalities the report captured happened at night. He adds that hi-tech but headlights that are operated differently from car to car can be confusing and might also mean that drivers are free-wheeling in the ambient light with no idea that their own lights are off. Light from their phone screens becomes even more distracting and requires more adjusting to and from as drivers’ gazes toggle between the phone and the road. Last week, a study determined that state bans on cell phone use while driving prevented over 1,600 emergency room visits last year. But just because a ban is in place doesn’t mean drivers actually stop using their phones. And these laws do nothing to keep pedestrians from staring down at their screens instead of keeping an eye out for oncoming traffic. Enforcing pedestrian laws is challenging though, says Retting. Retting believes that the answer is probably not changing the laws or the drivers – both of which are stubborn and slow to alter behavior – but lies in technology. ‘The good news on the horizon is that there is a good opportunity in technology to correct for errors people make,’ through things like automatic breaking and autonomous vehicles, Retting says.